Sure, classic skinny jeans never get old, but we love a good head-scratching trend to talk about too. The latest look that’s sure to spark some healthy debate? Layered jeans—and no, I’m not talking about layering clothes over your jeans (that’s so 2017). I came across Natasha Zinko’s Layered Waistband Jeans ($1095) and was immediately intrigued. “Triple the waistband, triple the fun,” as Jessica Minkoff, who is wearing the jeans above, noted. Who could argue with that? Upon further investigation, I realized that several other brands have also jumped on board with the layered jeans look. Sandro, Alexander Wang, and Tortoise all experimented with double waistbands, while Sacai and Y/Project interpreted the trend a bit differently. Oh, and if you want a layered denim jacket, Monse has you covered there too. 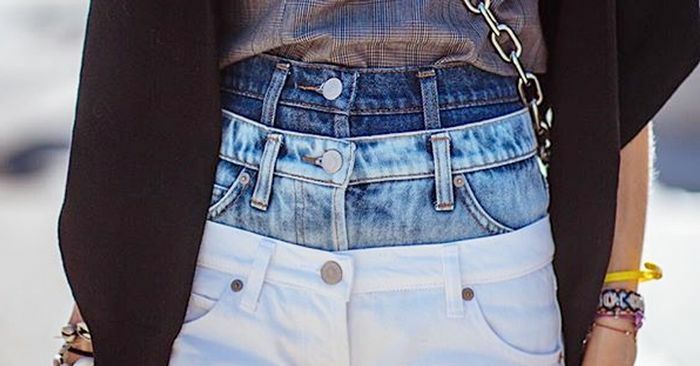 Scroll down to shop the denim trend you have to see to believe. Do Marriage Ultimatums Actually Work? Experts Weigh In. October 19, 2018 Comments Off on Do Marriage Ultimatums Actually Work? Experts Weigh In.